When the musical drama Oklahoma! opened on Broadway in 1943, it seemed to be a genre-defining moment. Although musical theater had been around for some time, the degree to which the play’s songs were integrated with the dramatic action was unprecedented, and the play enjoyed a record-setting Broadway first run of five years. This was the first collaboration of the already separately famous Richard Rodgers (music) and Oscar Hammerstein II (book and lyrics), and it set the stage for their string of subsequent hits that included Carousel (1947), South Pacific (1949), The King and I (1951), and The Sound of Music (1959). This was the indeed golden era of the American musical, and Oklahoma! has always been considered its epitome. The story of Oklahoma! is based on the 1931 stage play by Lynn Riggs 1931, Green Grow the Lilacs, that is set in Oklahoma in 1906, just prior to its attaining US statehood. A background context of this narrative is the eternal and metaphorical conflict between the cowboy and the farmer. Cowboys were the first arrivals in the territory and managed to cohabitate the open range for their wandering herds of cattle. Farmers arrived later with their contracts, rules, and land deeds. The more specific conflicts between cowboys and farmers concerned restrictive property ownership and water rights. More generally, though, the cowboy has always metaphorically represented the unrestricted and sometimes irresponsible adventurer – wild and instinctive. The farmer, on the other hand, has represented controlled sobriety and orderly social behaviour. This traditional cowboy-farmer conflict is well known to those familiar with American westerns and is merely the social context for Oklahoma!. 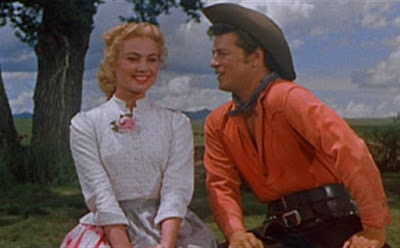 More specifically, the film’s story concerns the romance between the cowboy Curly (played by Gordon MacRae) and his sweetheart, the farm girl Laurey (Shirley Jones). 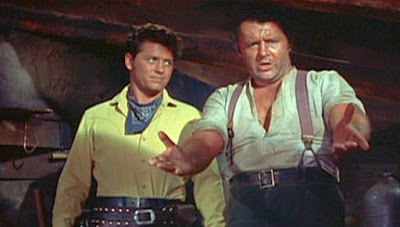 A persistent and troublesome contestant for Laurey’s affections is the hired hand Jud Fry (Rod Steiger). A secondary relationship providing a comic slant is that between another cowboy, Will Parker (Gene Nelson), and his promiscuous girlfriend Ado Annie (Gloria Grahame). These developments are set in the traditional theatrical arrangement of two acts separated by an intermission. The first act of the story is by far the most satisfying and features eight of the film’s eleven songs, including the delightful "Oh What a Beautiful Mornin'" (Curly), "The Surrey With the Fringe On Top" (Curly), "Kansas City" (Will Parker), "I Cain't Say No" (Ado Annie), "Many a New Day" (Laurey),"People Will Say We're In Love" (Curly and Laurey), and "Pore Jud is Daid" (Curly and Jud). Throughout this act, Laurey is playing hard-to-get with respect to what she perceives as the overly confident Curly. So, much to the consternation of Curly, she contrarily agrees to accept the invitation to the upcoming box social event from her other admirer, the surly Jud Fry. These interactions are spicily, but lovingly, overseen by Laurey’s guardian, her Aunt Eller (Charlotte Greenwood). 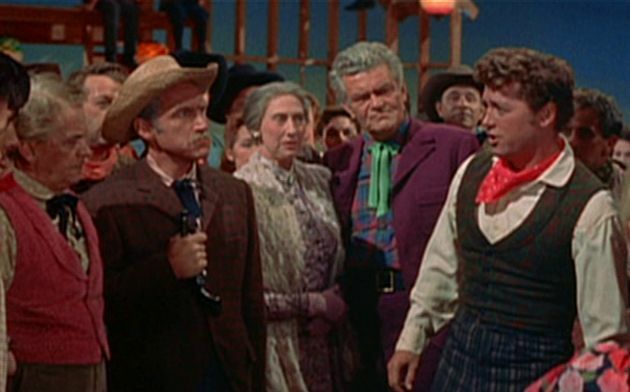 Also depicted are Ado Annie’s difficulties in choosing between her two ardent admirers, Will Parker and the traveling salesman Ali Hakim (Eddie Albert). The second act centers around the local box social, where the cowboys and the farm people get together and try to blend socially. On the way to the event, the insistent Jud Fry tries to force his affections on Laurey, but she manages to get away from him and arrive at the event alone. There are some subsequent rather artificial confrontations involving the various aspirants to the affections of Laurey and Ado Annie; but in the end, everything is resolved to the satisfactions of those we pull for. Now, one might say that Oklahoma! is just a bunch of nice songs stitched together into a trite narrative, but I think the film is much more than that. The film is essentially an emotive narrative presentation that keeps the audience “in tune” with the main characters throughout. Thus it is essentially an expressionistic production, where the expressionism is not so much present in the physical context, but rather in a musical context. There are some significant strengths and weaknesses to this presentation, though, that are worth highlighting. First of all, the music of Rodgers and Hammerstein is extraordinarily good. I usually appreciate music in terms of its melodic content and pay less attention to the lyrics. However, Hammerstein’s lyrics here are so rhythmically and thematically clever that they elevate Rodgers’s music to another level. Every time I rehear these lyrics, I marvel at the ingenious way Hammerstein managed to craft them. On top of that musical platform, the performances of Gordon MacRae and Shirley Jones, both in terms of emotive projection and vocal presentation, are outstanding. They articulate the lyrics very clearly and yet it all seems natural and emotionally authentic. There are other effective performances, too. Gloria Grahame, who was famous for her film noir roles, is peculiarly compelling as Ado Annie, and she presents an interesting contrast to Shirley Jones’s Laurey. Charlotte Greenhood’s Aunt Eller offers a crucial link between the various factions and seems almost to be a Greek chorus to the proceedings. And Gene Nelson’s spectacular dancing sequences in the role of Will Parker look effortless but demonstrate amazing agility and physical coordination. On the other hand there are some detriments, as well. The 13-minute-long dance sequence associated with the song “Out of My Dreams” at the end of Act 1 that was choreographed by Agnes de Mille is tiresome and enervating. 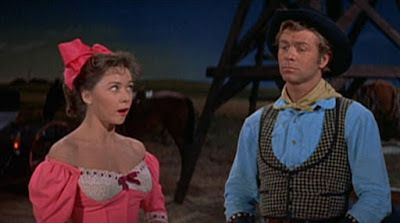 Earlier dance sequences in the film associated with the songs “Kansas City” and “Many a New Day” are briefer and better integrated into their songs. Here in the “Out of My Dreams” sequence, though, we have a distinctively separate and long balletic piece that disrupts the viewer from the main narrative. Moreover, it was ill-advised to show closeups on the dancers who represent substitutes for Curly and Laurey in this sequence. Their facial dissimilarities from those of MacRae and Jones are somewhat jarring and have the effect of distancing the viewer from empathic involvement. 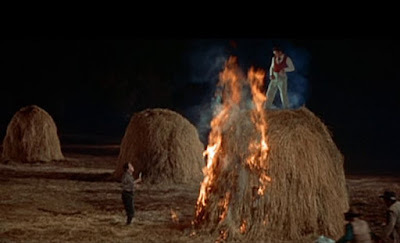 This kind of dance sequence may have served as a welcome break in the original stage-theatrical setting, but it is disruptive and ineffective in the cinematic context. The later filmed version of the Rodgers & Hammerstein musical Carousel (1956) also had a similarly disruptive balletic sequence that interfered with that film’s narrative presentation. Overall, though, the film is outstanding and holds up on repeated viewings. My favorite song from among the many memorable pieces in the film is "The Surrey With the Fringe On Top". What is yours? This is also related to the traditional conflict between cowboys (favoring the open range) and sheep herders (favoring fenced and restricted land). See “Sheep Wars”, Wikipedia, (10 December 2015).